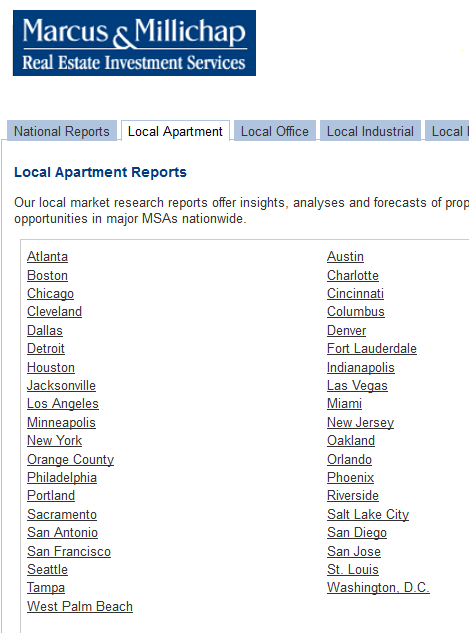 The NAHB is out this morning with a chart that gives some perspective on apartment building investment starts. 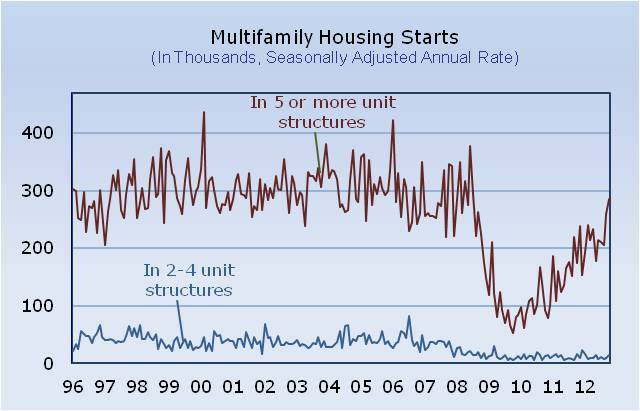 The Census Bureau reported 285,000 unit starts in October for 5+ unit buildings. At that rate it looks like we’re just returning to what was a sustainable level of starts in the ’97-’06 period. 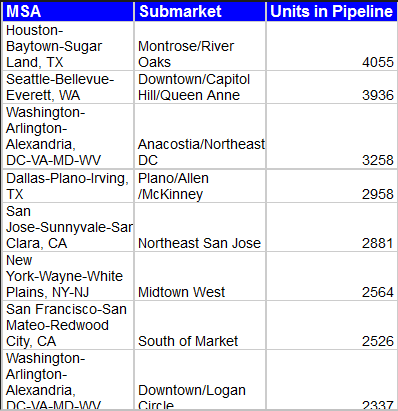 UPDATE: Top 10 US Submarkets for new apartment building units in the pipeline. In May we posted an article Top 10 US Cities for new apartment building permits where Seattle came in sixth in new apartment building units permitted. Now a new list is out from Axiometrics with a breakdown by submarket and Seattle’s Downtown/Capitol Hill/Queen Anne submarket lands at number two with almost 4,000 units due to come on line in the near future. And that’s on top of nearly 6,000 units (3,500 in the last two years) that have already been delivered downtown since 2005. Plus there are several other hot neighborhoods such as Belltown and South Lake Union that Continue reading UPDATE: Top 10 US Submarkets for new apartment building units in the pipeline. Posted on July 2, 2012 July 2, 2012 Categories Apartment Building Investment Cycle, Multifamily Design & Development, Multifamily InvestmentsTags absorption, Apartment Building Investing, apartment building investment cycle, apartment construction, Belltown, Capitol Hill, commercial property, CRE, downtown, employment, job creation, multi family development, new units, Queen Anne, Seattle, South Lake Union, supply, vacancyLeave a comment on UPDATE: Top 10 US Submarkets for new apartment building units in the pipeline.